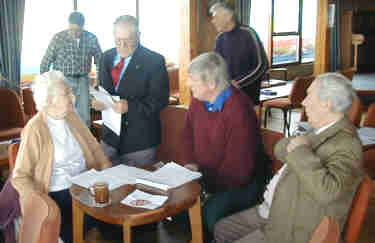 Some of the other attendees, Susan taking the minutes (left) Dave, Mary and Bill from The Stag Carnival Club and Bill Wickens (right) former Chair. Carnival treasurer Ray Hafseth presents Ryan Persaud with his £100 prize for the best Carnival Cover / poster design. 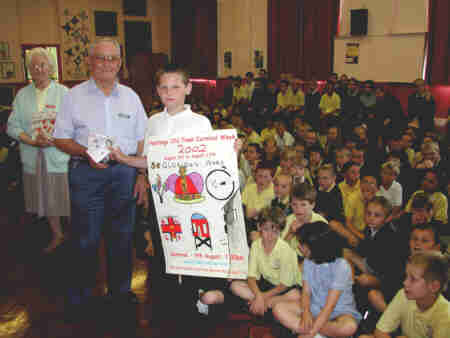 Ryan, aged 11, of All Saints CE School will spend some of the money on a new reel for his fishing rod. Kaddy Lee Preston, BBC's Weather Girl grabs a quick read of the Carnival Programme at the Bike Race on Tuesday.